The other day I lifted the spatula off its hook by the stove and almost plunged it down the side of a still-warm apple cake when I saw to my dismay that the spatula was slick with grease. Ever since I started letting the children take care of the dishes from start to finish, things like this have been happening—pans clean on one side but sticky on the bottom; whisk missing for days because it was hung in a new and surprising location. Quality control has gone out the window. I almost walked into the girls’ room to say something about the spatula, but stopped myself. I thought of the whisk and how my words of surprise at finding it again almost led to mutiny among the girls. “I’m not doing the dishes anymore since I can’t seem to do anything right,” I was told, and I began to see that I need to let go a bit. I don’t delegate much; back in St. Paul I see neighbors enlist their teenage children to mow the lawn, shovel the snow, run the laundry, mop the floor, but I want the jobs done right, so I keep doing them myself. I figure I’m sparing them the chores of life that they surely will do for themselves soon enough. But perhaps I’m also denying them the chance to learn, feel useful, enjoy the pleasure of getting their hands dirty and see the improvements made by their own labor. 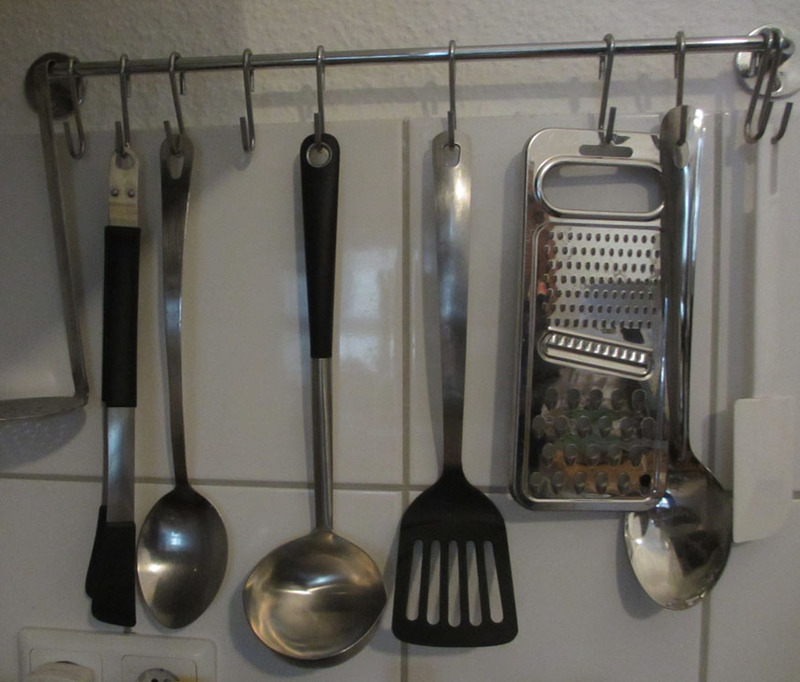 When I first asked C to help with the dishes here in Berlin, she looked at me in fear, as if I were asking her to produce a seven-course meal. “It’s easy, you’ll see,” I said. “Just watch your sister.” And I turned and left the room, unable to watch whatever spills or breaks might ensue. My helpful tips would only be construed as criticism, I knew, so I took myself out of the equation. And found to my surprise a fairly clean kitchen in the morning. Teaching can be as simple as showing by example, a phenomenon I noticed when I homeschooled our girls for a semester during our last sabbatical in rural New Hampshire. Just by sitting with 5-year-old C on the couch, taking turns reading aloud, I had the thrill of being the teacher with whom she blossomed from sounding out syllables to becoming a full-fledged reader. I’ve begun to participate in a sport training session offered to rowers in a school gym in Charlottenberg on Thursday nights. The leader is fluid, he has choreographed his entire workout to various mixes of house music; he never glances at his notes to figure out the next steps. Picture if you will a roomful of stilted rowers trying to follow a dancer’s moves to “Love is in the Air.” Matthias, the teacher, could take his whole routine out on the dance floor of any club in Berlin if he wanted, while we hop about and try to coordinate our feet with our hands and follow his natural flow. But our awkwardness does not trouble him. He’s not critical; he doesn’t correct us. His eyes are kind, and most of the time he’s not watching us at all—his eyes are closed in the dance. And sensing this, we all trust that we can follow him and find joy in the motion and the effort, even if the effect is not half as graceful as his. Several years ago a rower far better than me, once the third pick for an Olympic pair, asked me to race in a mixed double with him. I said yes, but after our first practice I was quick to give him an out, thinking now that he’d been in a boat with me he’d realize I was a lightweight, not worth his time. That small comment opened up the possibility that there was another way of looking at rowing, a way I might fit in. It changed everything, like tugging at a loose thread on your sweater and finding the whole thing unraveling in your hands. And after that, though I was still convinced this was some kind of mistake the world would get around to fixing sooner or later, I was given the space to grow, to row with someone better than myself and not be judged. I’ve seen how a teacher can carry her pupil, how E’s violin teacher can be the “mama whale,” as she puts it, and E the baby whale at her side, mimicking her every bowing. E performed a piece that stretched her skills in her last recital, and she very much needed her mama whale to set the pace and keep the tempo, indicating with slight sniffs and raised eyebrows when to begin or pause, little signals of how to make the piece sing. I’ve been the baby whale too; sitting on the erg beside my partner, following his steady stroke rate through a 2000-meter piece, skimming a quarter-minute off my previous time, no small feat. Sometimes we lead, and sometimes we follow. And sometimes our withheld advice is an act of grace. And isn’t that all teaching, mentoring, and parenting is? Giving another person the authority to take on a task they could not have imagined doing beforehand, letting them do it without critique or shame, and rejoicing in the effort? This entry was posted in Parenting, Rowing and tagged Berlin, ergometer, mentoring, Rowing, St. Paul, teaching, violin on January 20, 2014 by Jill M.. So so true Jill! Just being–either the guider or the one who is being guided– is so hard sometimes but so rewarding!! And rowing offers so many opportunities to do both. Thanks, Rhiannon!